Hoopsters in the 10-11 year old group share freindly conversation while warming up. Competitors wait patiently while listening to contest rules. Xavier Pierre took home the first place title for the 8-9 year old boys. 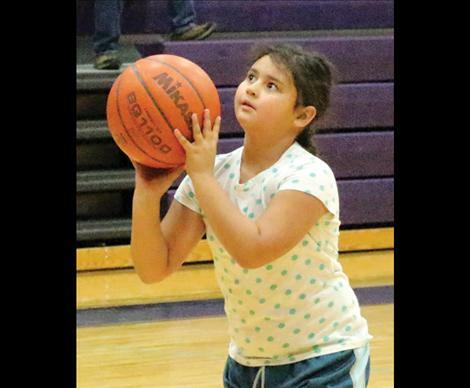 8 year old Dominique He-Crow eyes up her shot at Sunday’s Elks Hoop Shoot. POLSON – Compete. Connect. Succeed. 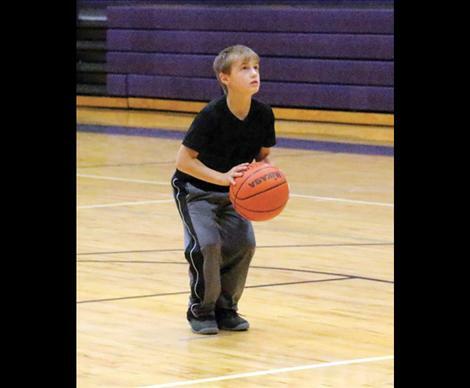 Young hoopsters ages 8 to 13 took those words very seriously while competing for a medal and a chance to move on to Districts in the Elks National Hoop Shoot held at Linderman gymnasium on Sunday. 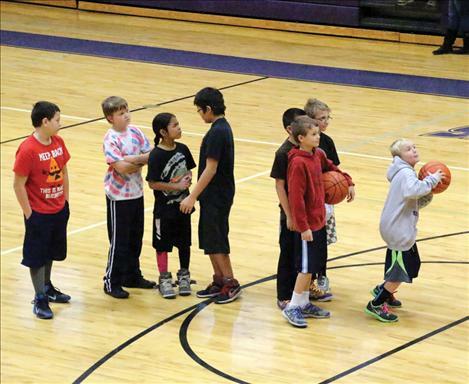 Sponsored by the Elks National Foundation behind the local Mission Valley Elks and coordinated for the last five years by David Rensvold, the Elks Hoops Shoot free throw program aims to bring youth interested in basketball together to have fun and meet new friends. The program also encourages healthy lifestyles and practices that will develop skills to aid in achieving school and life success. Completely free for the contestants, boys and girls are divided into groups according to age. 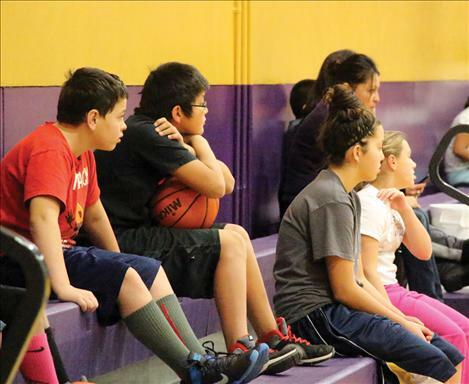 Each child is given time to warm up and shoot practice throws before brushing the sweat beads from their brows and putting on their faces of concentration when it’s their turn to step up to the free throw line with the goal of swishing the most free throws out of 25. The top shooter from each group will then continue on to the district competition, joining kids from all over Western Montana. If the first placer cannot attend districts for whatever the reason, second place will have the opportunity to take their place. 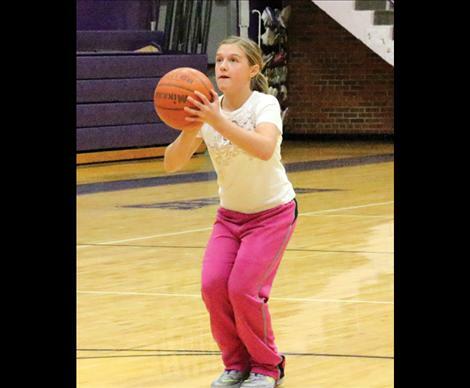 The first place shooters from each age group, moving into districts Dec. 6, were Caitlyn Ward (8-9) and Alex Pierre (12-13) for the girls, with no competitors signed up for the 10-11 age group. 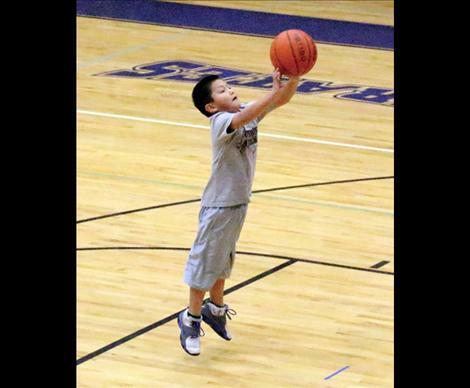 For the boys top shooters included Xavier Pierre (8-9), Jarrett Wilson (10-11) and Ryker Wenderoth (12-13). Second place went to Dominique He-Crow (8-9), Torrin Ellis (8-9), Isaac McNair (10-11), Berkley Ellis (12-13) and Trey Kelley (12-13). 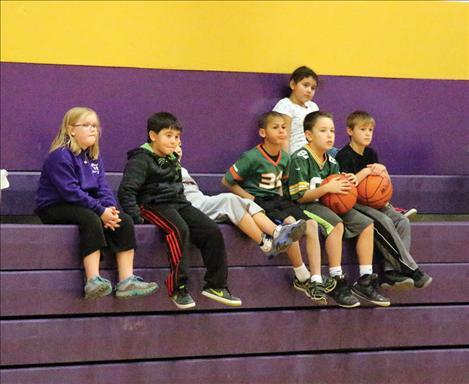 Though Rensvold has seen growth since his first year of involvement, he hopes the coming years will see more involvement from local physical education teachers, with the ultimate goal of the local schools having their own competitions and then sending their top five to 10 kids to the Elks event. 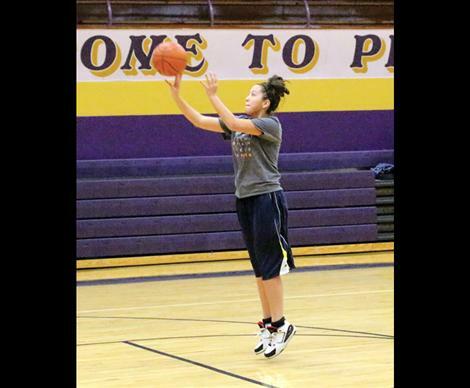 The District Tournament will be held at the Joe McDonald Event Center Dec. 6 and will host top kids from six local competitions. First placers at Districts will continue on to the State competition with the ultimate goal of continuing on to the National competition held in Springfield, Massachusetts. Winners of the National Title will be honored with their name permanently inscribed at the Naismith Memorial Basketball Hall of Fame. Two National Champions will receive the Getty Powell Award for the best score during the Finals. They will also receive a free trip for themselves as well as their parents to the Elks National Convention held in July.